The SKINTOP® HYGIENIC is specially designed for food and beverage production and it can also be used in the pharmaceutical industry – two areas in which hygiene is at the top of the agenda and good is nowhere near good enough. But how do you make a cable gland for electrical and electronic connections suitable for the highly hygiene-sensitive food industry? It all starts with selecting the right material. In the case of the SKINTOP® HYGIENIC, class V4A stainless steel is used for the body because it guarantees permanent corrosion protection and is able to withstand harsh conditions even in the long term. This, along with the use of sealing materials suitable for foodstuffs, makes the cable gland suitable for direct contact with food in production. The accompanying sealing material is one of the Lapp Group's new developments: a special elastomer certified by ECOLAB®. But it was not only the material that was central in the development process, the design was too. With the SKINTOP® HYGIENIC, the aim was to design a product without any corners or edges. This is because a cable gland in this sensitive area has to minimise the amount of 'attacking surface' where impurities can accumulate. Therefore all seals are moulded to seal the gaps between components perfectly without creating any cavities. All threads are also fully covered. Additionally there is no hexagon on the cable gland – instead, each one has two flat surfaces to which a wrench can be fixed. Corners, edges, cavities and grooves in which microbes might settle are prevented in this way. 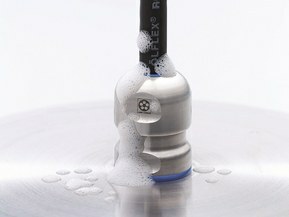 The SKINTOP® HYGIENIC has earned its name then – as well as three special certificates: the cable gland has FDA approval. That means that the materials used are permitted by the U.S. Food and Drug Association, being classed as harmless. Additionally it has the ECOLAB® certification which attests to the resistance of SKINTOP® HYGIENIC to cleaning agents. As well as this chemical test, it also passed a mechanical load test for sealing ability and strain relief and was also tested for material ageing. The SKINTOP® HYGIENIC was ultimately also successful in what might be the toughest test of all: the EHEDG certification by the Weihenstephan Institute in Freising, Germany. In the autumn of 2014, it became the first ever product to be subjected to the new, more stringent testing procedures. Previously the certificate was awarded solely based on theoretical testing where CAD drawings were examined and material lists were monitored – the new, more demanding testing simulates extreme conditions in practice. The Lapp cable gland passed this resilience test with flying colours and can quite rightly be called hygienic – and it can live up to its name while being used anywhere in the food and pharmaceutical industries.